In 2017 I had a lot of great conversations with a wide variety of thought leaders. I gathered up some highlight clips from last year’s podcast interviews and put them into one podcast mashup. These clips show how customer experience can be defined and implemented, what it means for businesses in the future, and more. The first interview I looked back on was with Mary Winfield, VP Customer Experience and Trust at Lyft. The company has to focus on two sets of customers: drivers and passengers. The entire business model is centered around making customers’ lives easier, from providing services people want and need to using technology that makes things simple and efficient. She describes the symbiotic relationship between employee experience and customer experience at Lyft. 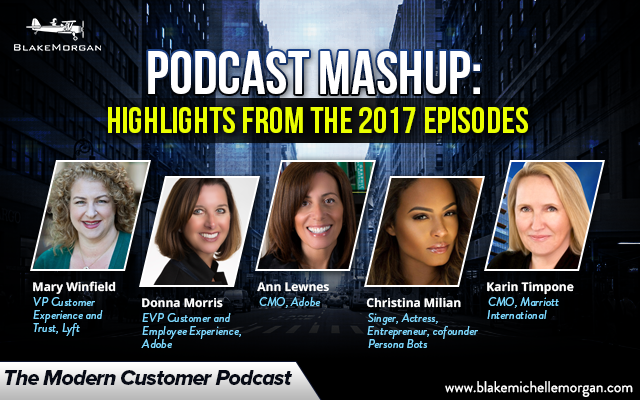 Donna Morris is the EVP Customer and Employee Experience at Adobe. I visited the Adobe offices in San Jose, and we talked about the future of customer experience. She believes the role of customer experience is only going to grow. Digital technology will have a huge part in the future and will need to ‘emote’ as face-to-face interactions are going away. This will direct how organizations think about the customer experience and creating great experiences without the human element. Under the direction of Adobe’s Chief Marketing Officer Ann Lewnes, the company created an attention-grabbing ad that reached out to customers and kept their attention. In this clip, Ann talks about the Adobe commercial that starts with a bank robbery and ends by showcasing digital technology and customer experience. One of the hottest topics of 2017 was the chatbot. The next podcast interview is with singer, actress, and entrepreneur Christina Milian. Together with her business partner Josh Bocanegra, they created Persona, a tech company that builds chatbots for celebrities. Christina describes the value the chatbot brings to her brand, how it works, and how to get started when considering adding a chatbot to your company. The future of marketing is not an easy thing to scale. Karin Timpone, CMO of Marriott International, is definitely up to the task. Marriott has a focus on Guerrilla marketing and jumps on real-time marketing opportunities via social media. One recent example was the Pokemon Go craze. Marriott’s social media team put its efforts on high octane and placed Pokémon monsters in pools knowing that guests photographed them and that they would possibly go viral. They got wind of one Pokémon Go super user and decided to sponsor him by sending him to Japan, Australia, and Europe to catch more Pokémon. Social media is a powerful way for marketing teams to engage with customers in real time, but it requires marketing to constantly have eyes and ears on the ground.